Sometimes when you read a brief for a project or exhibition, you’re genuinely uncertain of your own suitability. It can feel a little like trying to shove a square into a circle shape, as you try to think of ways in which the work you feel driven to make could fit the criteria. Other times, the words seem to be talking directly to you. 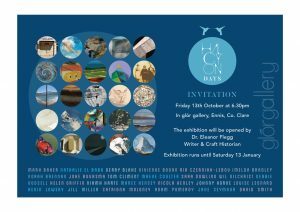 When I saw the title for Glór’s exhibition Halcyon Days, it was definitely the latter! Nowadays, the phrase simply evokes nostalgia or the harking back to better times but it originated from the Greek mythological bird Halcyon who created a floating nest in the Aegean, calming the waves for fourteen days while she cared for her eggs. So much of my work is about how we process memory, how we fragment, reconstruct and often times romanticize the past. 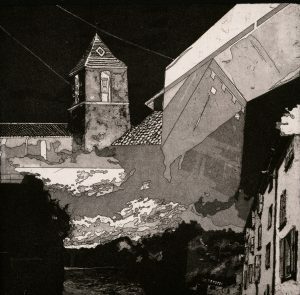 I’m delighted to have had two etchings selected for Glór’s current exhibition. Ma Soeur D’un Autre Monsieur and Les Gorges du Verdon were inspired by time spent in Provence, France. There was something almost intoxicating about the light there, the drama of the shadows it cast. 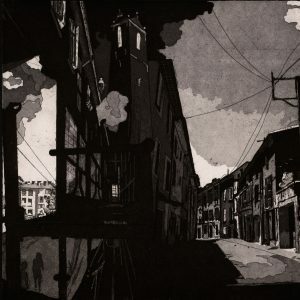 It is a place I return to, the streets familiar from the times I’ve walked them and drawn them, photographed them and etched them. Glór have made a really interesting selection of artists and work, showing print, photography, textiles, video, painting, ceramics and more. If you find yourselves near Ennis, do drop in!